Aberdeen Arms is a luxury waterfront condominium building located within the Boca Highlands Beach Club & Marina in Highland Beach, FL. This mid-rise condominium building is home to 117 one- and two- bedroom condominiums overlooking the beautiful Intracoastal Waterway and the Atlantic Ocean. The Aberdeen Arms condo community offers a host of resort-style amenities that residents may enjoy year round. Among the first-class amenities at Aberdeen Arms is a luxurious swimming pool with a stunning backdrop of the Intracoastal, a top-of-the-line fitness center, and the exclusive beach club. In addition to the highly-desirable amenities, Aberdeen Arms treats its residents to various social events held on the property throughout the year. These special events include the Christmas Boat Parade party on the marina deck, happy hours on the sunset deck, parties on the pool deck, and even barbecues on the garden deck. There are even special get-togethers in the social room, and space for intimate dinners on the honey-moon deck. No matter your interest, there is something for every Aberdeen Arms resident to participate in year-round. Residents not only have access to the luxury amenities at Aberdeen Arms in Highland Beach they are also members of the Boca Highland Beach Club & Marina. Residents can put their feet up at the elaborate pool deck made for relaxation or feel the salt water blow through their hair at the South Palm Beach County beaches. The Boca Highland Beach Club & Marina is perfect for boat owners, with a space to store your boat safely just steps away from your residence. Active residents can attend social events like Super Bowl parties, Mahjong tournaments and many more all just on the second floor of the Banquet Room that has stunning views of the ocean. If you would like to learn more about Aberdeen Arms condos or any other condos for sale in Highland Beach, FL, please call us at 561-403-0111. You may also reach us by completing the brief online contact form provided below and one of our Highland Beach real estate experts will be in touch to assist you. 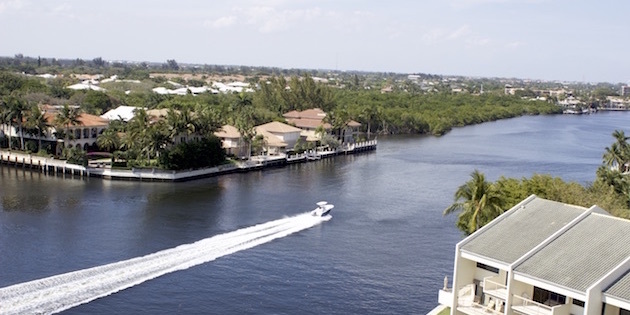 With our East Boca Raton office located right in the heart of the Boca beachfront, Champagne & Parisi Real Estate is your go-to resource for oceanfront condos for sale in Boca Raton & Highland Beach, FL.